Most projects start with consulting – helping you understand the options to select the best plan of action. Throughout a project, consulting plays an important role, as we help you learn about the systems and software that are implemented. After a project has been completed, we provide consulting on upgrades and proper maintenance procedures. Specialized by Product – Our team is organized by each Sage product we support. Product teams are led by a Vice President with management responsibility of all functional consultants, technical consultants, trainers, and developers. With a portfolio approach, we focus on and master the specific Sage solution for the best customer experience. Proven Methodology – RKL eSolutions is committed to delivering our projects on-time and on-budget. 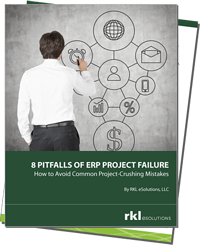 We follow a step-by-step proven project methodology from start to finish. Success isn’t defined by your go-live alone. Continual business consultation allows us to assess challenges, apply best practices, and optimize the user experience for maximum results and ROI. Dedicated Help Desk – We staff our own Help Desk with functional and technical experts to assist you when you need it most. 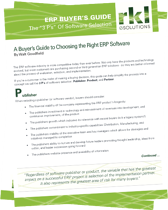 If you’re in the midst of buying or choosing ERP software, this guide can help simplify the process into a concept we call the 3 P’s of Software Selection: Publisher, Product, and Partner.